This Seasoned Cauliflower Rice is very easy to make and has a Mexican spice combination that gives the side dish a delicious flavor. I served it recently with my Mexican Chori Pollo Recipe to make a lovely and tasty gluten free meal. 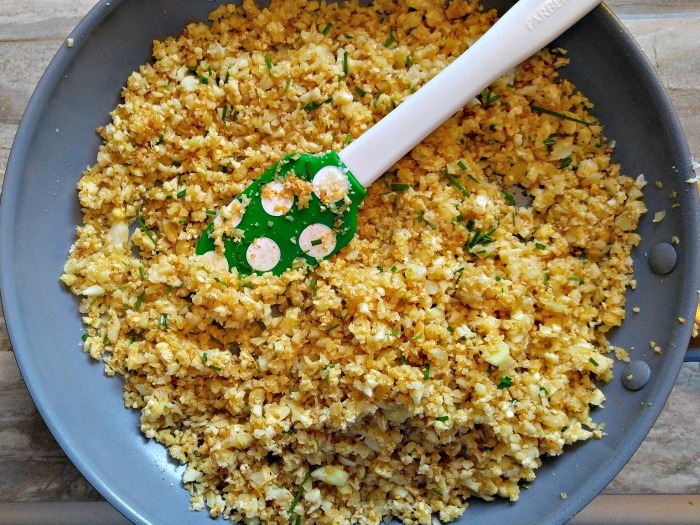 Making Seasoned Cauliflower Rice is quick and easy! I love carbs as much as the next person, but they have a love hate relationship going on with my hips. So using a low calorie vegetable like cauliflower and turning it into a rice substitute has its appeal. 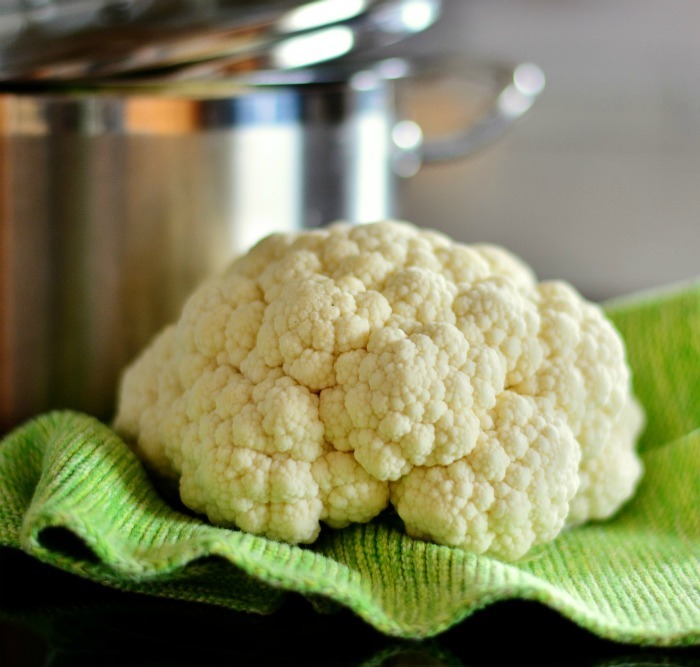 I must admit when I first heard about using cauliflower instead of rice, I was very skeptical. I didn’t cook cauliflower much since I don’t think it has a lot of flavor, but this is exactly the reason that it works well as a substitute. The cauliflower takes on the flavor of whatever liquid you cook it in and whatever spices you add to it. 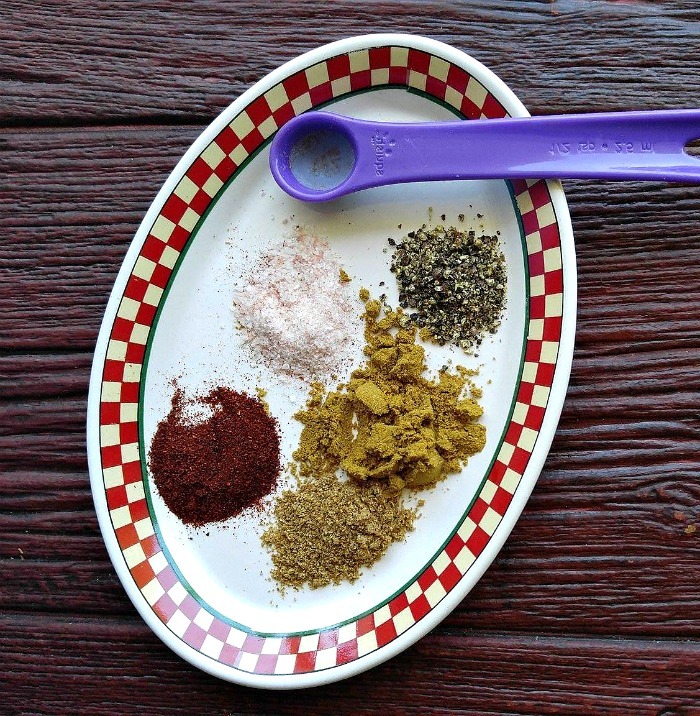 In this recipe, it’s a lovely blend of Mexican spices and some chicken broth. Pulsing the cauliflower in a food processor makes it into light and fluffy granules with a consistency much like couscous or rice. It is very tender and has just the right about of “bite” to it so it makes a great alternative to rice when you are trying to limit carbs and calories. 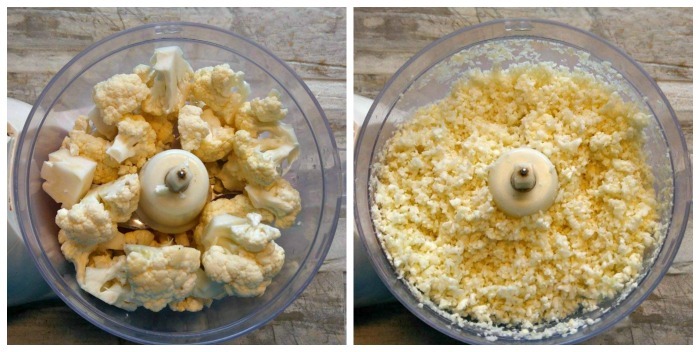 Start by placing your cauliflower pieces into the food processor and pulsing them to get just the right consistency. You can add both the florets and the stalks. Once you have it pulsed, remove any large pieces that did not get ground down enough. Don’t pulse too much or you’ll end up with mush. It does look like rice, doesn’t it? Now the rice needs cooking. I started with some clarified butter in a non stick pan and added the rice and cooked it gently for about 2 minutes. I chose clarified butter since it removes the milk solids, but olive oil or your favorite oil will work, as will regular butter. One of the beauties of cauliflower rice is how quickly it cooks. Instead of 20 minutes for normal rice, this version needs about 5 minutes in total! Add the spices to the rice and then stir in the chicken broth. Cook for another 3 minutes until the cauliflower is cooked but not too soft. The dark brown spices will add some color to the rice so that it begins to look a bit like brown rice. The final step is to add some chopped fresh chives to the rice to give it just a touch of fresh green color and a light onion taste. Chives are always best served fresh and growing chives is very easy to do. That’s it. Five minutes, a bit of seasoning and you have perfectly seasoned cauliflower rice to add as a side dish to your favorite Mexican meal. 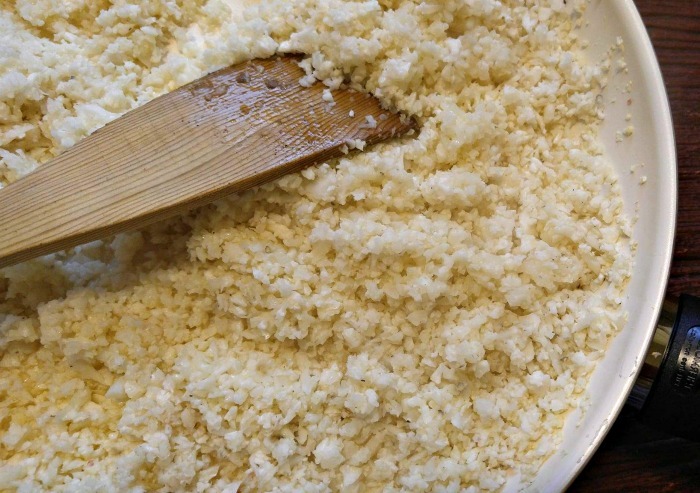 Cauliflower rice has a lovely grain like texture and is very light and fluffy. My grain eating husband (who is trying to lose weight but hates dieting!) actually comments when I make it that he likes it a lot. It is also a great way to sneak veggies into a meal. 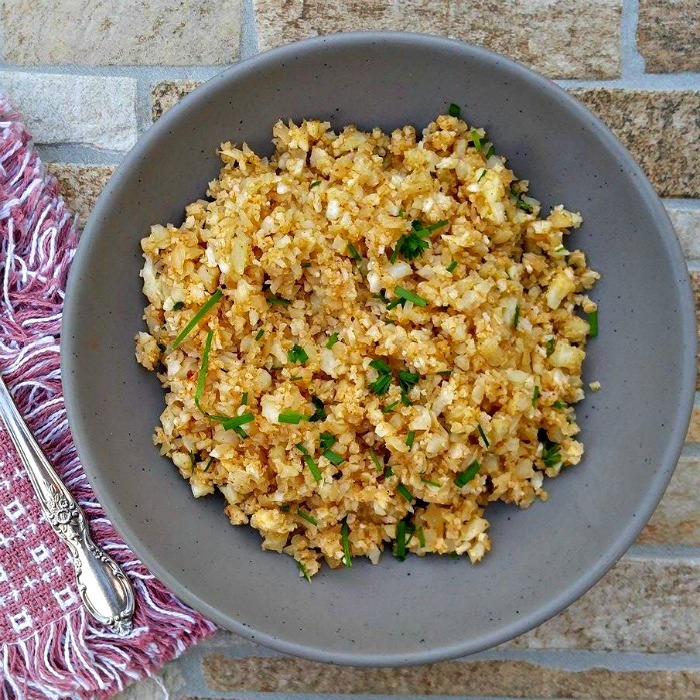 This delicious seasoned cauliflower rice has a nutty texture and a smokey flavor from the spice blend. It does not have too much heat and has a warm buttery taste. Cauliflower really shines in this recipe. It turns a healthy vegetable into a low carb side dish with about 1/4 of the carbs and WAY less calories that normal rice. The rice takes on the flavor of the spices beautifully and can be used as a base for dishes with sauces, stir fries and any other type of meal that you would normally serve with rice. Try some today. The flavor may surprise you! This recipe is Paleo, Whole30 compliant, Gluten Free and Dairy Free. 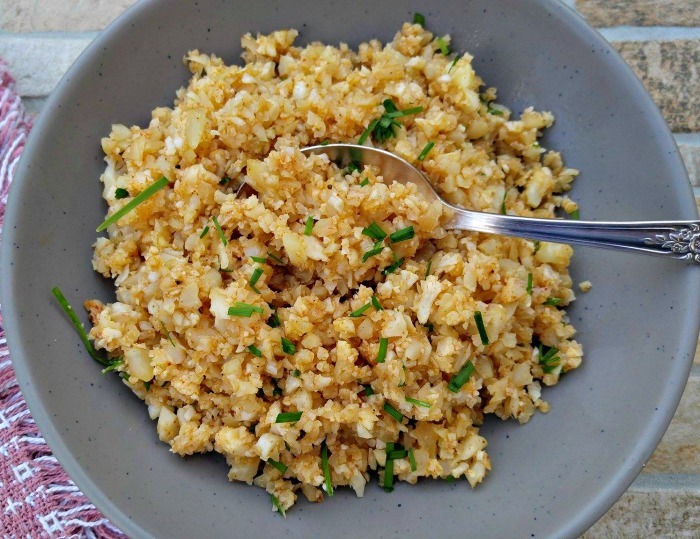 This Seasoned Cauliflower Rice is very easy to make and has a Mexican spice combination that gives the side dish a delicious flavor. Place the cauliflower in a food processor and pulse for a minute or so until you get a rice like consistency. Remove any large particles. Add the clarified butter to a non stick pan and cook the cauliflower for about 2-3 minutes until it starts to soften but is not fully cooked. Mix in the spices and continue cooking another 3 minutes until the rice is cooked and the consistency is as you like it. Don't cook it too long or it will get mushy. Stir in some fresh chopped chives for a bit of extra color. I love gardening, and then once plants are harvested I start canning and drying them. This dish is a winner for me,it seems like I am always making the same thing. Thank you so much for sharing such a great recipe.